Heat the oven (with the oven rack in the middle) to 350°F. 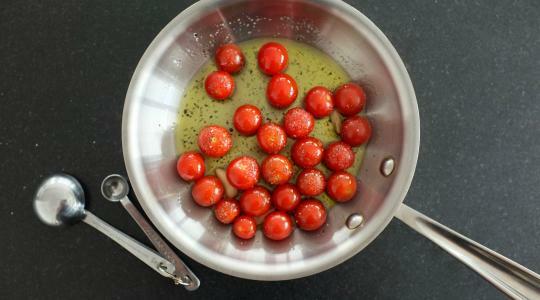 Put the tomatoes, garlic, and oil into a small ovenproof skillet. Sprinkle with the salt and pepper (about 6 turns on pepper mill) and toss together. Roast until the tomatoes burst, soften and shrivel, about 45 minutes. For the eggs, fill a medium saucepan with ½ inch of water, place over medium-high heat, and let come to a boil. 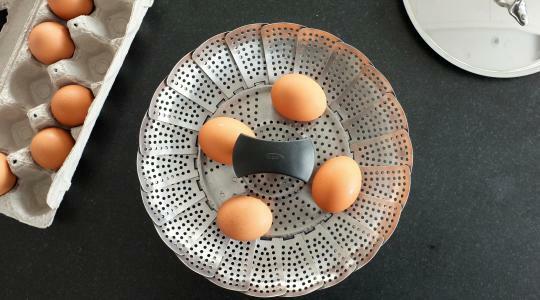 If you have a steamer basket, put the eggs into it and lower the basket into the pan. Otherwise, carefully add the eggs to the water. Lower the heat to medium-low so the water simmers gently and cover with a tight fitting lid. Steam the eggs for 6½ minutes. This will give you a soft yolk with a perfectly cooked white. 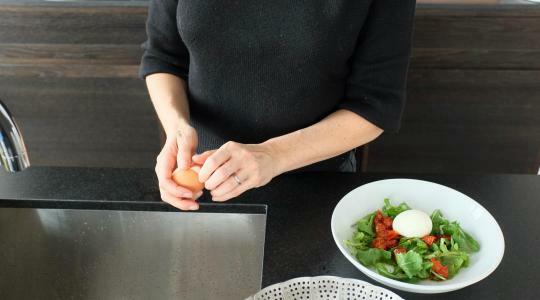 Immediately crack each egg several times on the side of the sink and peel. You can pass them under cold running water while you peel if they are too hot to handle. 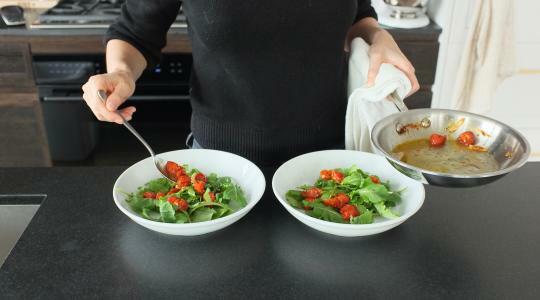 Divide the arugula between bowls. Top with the roasted tomatoes, garlic, and the eggs. Sprinkle the eggs with a little more salt and pepper to taste.